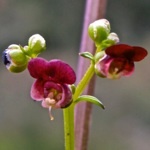 Scrophularia are weeds with the common English name of figwort, they often goes unnoticed as the flowers are small and dull in colour, but a careful inspection reveals a curious flower structure. They can be difficult to identify one from the other by the flowers but are recognised by the leaves. They attract pollinating insects not by a sweet fragrance but an unpleasant odour. This gives rise to the Greek name for the plants vromohorto (βρόμοχορτο), meaning dirty plant. 1.Ardalan Pasdaran & Azadeh Hamedi. The genus Scrophularia: a source of iridoids and terpenoids with a diverse biological activity. Pharmaceutical Biology. 2017.